Vishnu is the highest god of Vaishnavism, currently the most popular sect of Hinduism, and in many respects a religion in itself. In Vaishnava tradition, Vishnu becomes all. As Narayana, the mover of the waters of life, He is the manifested Brahman. As Mahavishnu, He is Isvara, the Supreme Lord. 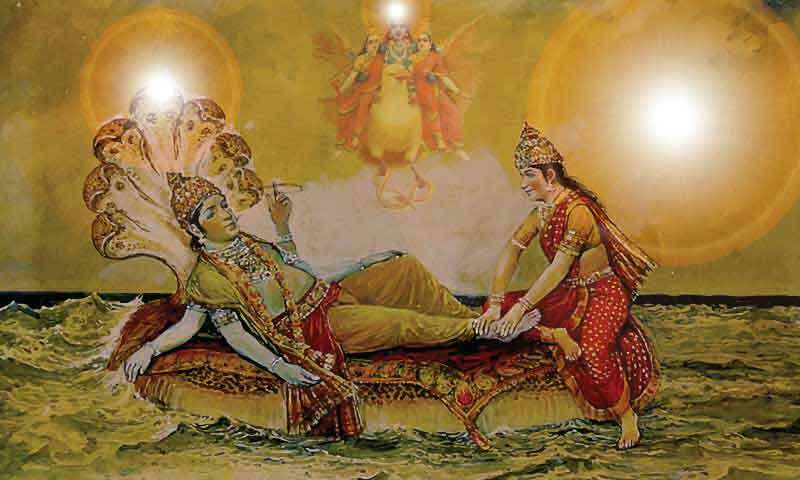 As Vishnu, He is the preserver. He is not only a part of the triple gods, Brahma, Vishnu and Siva, but the Hindu Trinity itself. The Vaishnava tradition of Hinduism recognizes five aspects of Maha Vishnu, the supreme being1 (paramatman), as described below. All these are reflections of Vishnu in the qualities of Nature. Para, the transcendental Supreme Being beyond all. Vyuhas, the emanations of God who reside in the higher planes. Vibhavas, the incarnations of God who appear upon earth from time to time. Antaryami, the immanent being who resides in all beings as a partner of the soul. Arcavatara, the consecrated image of God made out of earthly material, which is worshipped by His devotees as God Himself. In his highest and supreme aspect Lord Vishnu is Narayana himself known to his devotees variously as Paramatma, Parabrahma, Paramapita and so on. Bhumi or Bhudevi and Nila or Lakshmi or Sri Devi are his consorts. He is described as having four arms, each holding a particular object, usually a conch, a mace, a lotus and a discus. The divine jewel Kaustubha adorns his chest. Seated on Adishesha, the primal serpent, in the diamond hall of thousand pillars, its entrance guarded by Jaya and Vijaya, he keeps a relaxed but attentive gaze upon the three worlds, watched by the Free Souls, Ananta, Garuda and other dwellers of his magnificent world known as Vaikuntha. He is the creator and lord of the Universe. The creator Brahma arises out of his navel, as he rests on the endless coils of the Adishesha in the waters of life, and begins the process of creation. He is the only pure (suddha), supreme (para) and absolute (ananta) principle (tattva). He was before creation, without a beginning and an end and is also the cause of creation. The Narayana Anuvaka of the Taittiriya Upanishad describes Him in the following words. "In short, whatever is seen and whatever is heard in the world, all that, Narayana, pervades inside and out. He is the infinite and changeless seer who resides in the waters. He bestows boons upon the world...He is Brahma, He is Siva, He is Indra. He is the liberated soul. He is the supreme master with absolute lordship." It is true that followers of Vishnu and Siva differ in naming the transcendental supreme being. But the fact is Siva and Vishnu are different names of the same eternal principle who is described in the Upanishads as Brahman. The emanations or vyuhas of Lord Vishnu are his projections. They exist in higher planes, far and above ours, to perform different functions on an universal scale. The vyuhas are said to be four2 in number, namely Vasudeva, Samkarshana, Pradyumna and Aniruddha. The ulitmate source of all emanations is para or the transcendental being and each successive emanation emerges out of its preceding one. Collectively they possess all the qualities of the transcendental being, but individually they are endowed with specific qualities and energies according to the tasks they perform. These qualities are knowledge (jnana), power (shakti), strength (balam), lordship (aisvarya), virility (virya) and tejas (brightness). Of the four vyuhas, Vasudeva possesses all the six qualities of the transcendental being, since for all practical purposes he is the same as the latter. Bliss is his supreme nature which the free souls experience in their state of liberation. Samkarshana has the qualities of knowledge and strength. He is the destroyer and enforcer of scriptural knowledge. Pradyumna possesses lordship and virility. He is the creator of the universe and upholder of the dharma. Aniruddha possesses virility and splendor and responsible for the standards of truth and protection of the world. The color of the four beings said to change from one yuga (epoch) to another. They are white in Kritayuga, ruddy in Treta yuga, tawny in Dvapara yuga and blue in Kaliyuga. The four Vyuhas or emanations of the Supreme Being described above exist in the four planes of creation which correspond symbolically with the four states of human beings. the waking state (jagrat) in which the senses are active. Our world is part of this. In this plane the four Vyuhas are called Jagra-Vyuha. Together they are responsible for the creation, maintenance and destruction of the worlds. They have bright colors and carry weapons banners and other objects. the dream state (svapna), in which the mind alone is active. These are the mid regions of the universe. In this plane the four Vyyhas are known as Svapna-Vyuha. They do not have any specific functions like creation and maintenance, but only the intention to do so. Their colors are not very bright. They carry only weapons. the transcendental state (turiya) in which the mind is absent, the breathing is suspended and one is beyond the mind and the senses. In this plane the Vyuhas are known as Turiya Vyuha. They do not possess any body and do not have any color. They remain in a state of self-absorption enjoying divine bliss. Of them, Vasudeva has all the six qualities and the rest two qualities each. Symbolically these four states also represent the four meditative states of a spiritual aspirant. In the jagrat state a practitioner of meditation has is no control over his senses and his mind is unsteady. In the next stage of svapna, he has control over his senses but not over his mind which is still unsteady. In the third successive state he gains control of the senses and mind, but his breathing is still going on and he has some vague sense of identity. In the fourth and highest state his breathing stops completely and he becomes self-absorbed, losing all notions of forms and identity. The four Vyuhas in turn are said to be responsible for the emergence of 12 other sub emanations known as Vyuhantaras. Each of these vyuhantaras have distinct color, form, qualities and powers. Each is associated with a specific caste-mark (urdhva pundra) upon the body and need to be meditated upon in a prescribed manner. The following table shows their names, appearance, and the source of their origin. One can see the 12 vyuhantaras of Vishnu carved on a wall in the Sriranganatha temple of Srirangam. In this aspect God manifests himself upon earth as an incarnated being. He lives amidst people, undergoes the same experiences as the earthly beings, distinguishes himself by his deeds and words and interacts with them as one of their own kind. Although an incarnated being lives amidst people and acts like them, he is not subject to the law of karma, nor bound by the limitations of nature. He may disguise his powers willingly, but not subject to the laws of Prakriti either. Through his actions and words, he personifies the highest ideals of mankind and serves as a role model for his devotees to follow. Because of ignorance and delusion, ordinary people cannot recognize his true identity. So they mistake him as one among themselves and fail to show respect. But the wise and the enlightened recognize an incarnation instantly when they see one, either because they are part of the purpose of his incarnation, or because they are so dear and devoted to God that He would give them an opportunity to meet Him and savor His divine presence. The concept of avatar, made popular by the Vaishnava tradition, is a very unique to Hinduism. It sets apart Hinduism from other religions because it not only vouches the intervention of God in human affairs indirectly through such means as prophets, messengers, sages and seers but also at times directly as an incarnated being. An incarnation connects God to people in a very personal and emotional way. It rekindles in them a sense of hope and possibility in the face of suffering and adversity. To be in the presence of God physically and to be part of His divine drama on earth is a devotee's most cherished dream which an incarnation of God makes possible. It is said that if a few pure souls joint their hearts and minds and sincerely pray to God to incarnate upon earth to eradicate evil, He would do so. An angel or a messenger may speak on behalf of God and help you know what God wants us to do. We are not sure how much communication would be lost in the process. But as an incarnation God speaks to mankind directly, not only through his words and preachings but also through his actions and the ideals He pursues. In the devotional path of Hinduism (bhaktimarg), God is viewed not as a mere spectator, some one who sits high in the heaven and dispenses justice in the most cold and callous manner ignoring the ground realities, but a dynamic, responsive, emotive and self aware being, who responds to the calls of His devotees out of unconditional love and involves Himself directly in their lives. If the situation so demands He would manifest Himself in a physical form, with all or part of his abilities and powers and comes to our rescue. The concept of avatar has been explained very clearly in the the Bhagavadgitaby Lord Krishna who reveals himself as the supreme being to Arjuna and informs him the purpose of his incarnation. The following words from the scripture are the basis for our belief in the incarnation of God3. "Although I am unborn and inexhaustible, and although I am the Lord of all beings, keeping nature under My control, I manifest Myself by My own self induced illusion (maya). Whenever and wherever there is decline of dharma (righteousness) and ascendance of adharma (unrighteousness), at that time I manifest Myself in visible form . For the protection of the righteous and destruction of the wicked, and for the sake of establishing dharma again, I incarnate Myself on earth from time to time." Avatar means to appear, to descend, to take birth or manifest. Technically, we all assume different avatars in the course of our lives to play different roles and fulfill different purposes. But these are not true avatars. An avatar is the physical presence of God on earth either as a man or an animal or some mythical creature to accomplish a specific objective or set of objectives. It is not a temporary materialization of God before his devotees. It is neither a disguise nor a trick played upon our senses. God has been appearing to people since long to convey some message or impart some advice or accomplish some objective. His voice has been heard by countless people either internally through the subtle channels or externally through actual hearing. He appeared personally to several sages, seers and even demons like Ravana or Hiranyakasipu who did severe penances to obtain boons from Him. He conversed with them and fulfilled their hopes, dreams and aspirations. On occasions he also disguised himself as a man or an animal to accomplish certain objectives. During the churning of the oceans by both gods and demons for the sake of amrit, the elixir of life, Lord Vishnu assumed the form of Mohini, a beautiful damsel, to help the gods and delued the demons. Lord Siva came in the disguise of a tribal warrior to test the courage and devotion of Arjuna. God always responds to our sincere prayers and calls. These appearances, however, are not incarnations, but appearances of God. By definition an incarnation is different. It requires the birth of God in physical form through the natural process and his existence upon earth in physical form, undergoing the same experiences as living beings. It is not necessary that the physical form needs to be that of a human being. It can be a human, animal or semi human or even a mythical form. It may exist for a brief period of time or for a life time. An incarnation may have all the powers and awareness of God in His absolute aspect or only a necessary portion of it. It is also said that when God incarnates upon earth, He does not incarnate alone. A number of associate divinities and evolved souls also incarnate upon earth to play their part in His incarnation and assist Him. At the same time a number of demons also become active in the physical and astral planes to counter and thwart the purpose of the incarnation and provide the necessary opposition in the divine drama that is played out with the self-induced participation of God. An incarnation is essentially an interference in the normal progression of the manifested worlds. It becomes necessary due to the remorseless violation of divine laws by the actions of beings endowed with free will. The law of karma makes each individual being responsible for its action. But in some cases that alone would not act as a deterrent to prevent people from indulging in evil pursuits and causing a great imbalance in the working of the worlds or interfering with the lives of other people. When their number increases disproportionately, a much higher and potent force is required to deal with them. God is not judgmental. But He would also not remain static to the calls of his devotees. So when the situation reaches a boiling point, He decides to take matters into His own hands and come down to earth in physical form to restore order and morality. In Hinduism, an evil force is not opposed to God against His will. It is a force that works for God in its own evil ways. God uses these forces to create situations that warrant His intervention. It is part of His divine drama already planned and embedded in the design. Most of the demons that He slew during his many incarnations were but his own devotees who out of arrogance asked for things that would ultimately lead to the welfare of the good and the destruction of the evil and themselves. From the perspective of duality, we may say the demon was destroyed by a divine force for a good cause. But from the highest perspective of the unity of all creation, we cannot deny the fact that by destroying the evil force God facilitates its ultimate dissolution into Himself and the dawn of a new awareness and promulgation of a new code of conduct among people. So from the highest perspective, an incarnation is a drama (leela) with in a bigger drama (maha leela), orchestrated by God for his own enjoyment and for keeping His laws in place. This, in brief, is the purpose and justification of an incarnation, which the followers of Vaishnavism accept as an undeniable truth. Matsyavatara. In this incarnation Lord Vishnu assumed the form of a fish to recover the Vedas from a demon and return them to Brahma for their continuation. He also rescued Manu (the primal man) from a flood that inundated the whole earth by carrying his boat to the top of a mountain. Kurmavatara. In this incarnation, Vishnu assumed the form of a tortoise and held the Mandhara mountain from beneath as the gods and demons used it to churn the oceans for the sake of amrit, the elixir of life. Varahavatara. In this incarnation He assumed the form of a boar and slew a demon named Hiranyaksha when he carried away the goddess earth to the nether worlds. Narasimhavatara. In this incarnation He helped his young devotee Prahlada when he was tortured by his demon father, Hiranyakasipu for his intense devotion. Listening to the calls of his young devotee, He sprang out of the pillar of a building as Man-Lion (Nara-Simha) and slew the demon. Vamanavatara. In this incarnation Vishnu took birth as a dwarf to slay the demon Bali and restore the heavenly kingdom of Indra back to him. With one step he covered the whole earth. With another he covered the whole empyrean and with his third he pushed Bali's head deep into the nether world. Parashuramavatara. In this incarnation He assumed the birth of a priestly warrior to exterminate the Kshatriyas who grew wicked and tyrannical and neglected their duties in upholding the dharma and protecting the people. Sri Ramavatara. In this incarnation He took birth as the prince of Ayodhya to kill the demon Ravana who became invincible by virtue of the boons he got from Lord Siva and became a menace to the three worlds and their inhabitants. Sri Krishnavatara. As a cowherd and leader of the Yadus, He slew several demons including Kamsa. Later he helped the Pandavas in the Mahabharata war against their evil cousins. In the battle field he also revealed the divine knowledge in the form of the Bhagavadgita (celestial song) to his friend and relation Arjuna. Kalkyavatara. This incarnation is expected to come at the end of Kaliyuga, when disorder and chaos rule the world and people fall into evil ways, neglecting dharma entirely. It is believed that Lord Vishnu will descend into the world with a fierce form as Kalki and root out all the evil to herald the end of the present dark age and the beginning of a new golden age in which only the pure souls exist. Included in this category are partial or minor incarnations of God in which He imparted His knowledge, powers or qualities to several advanced Jivas, either directly or indirectly, for the benefit of the mankind. The list of minor incarnations of Vishnu is exhaustive. The following contains some of his most important vyuhantaras. According to Vaishnavism, God is not only transcendental but also immanent. He is hidden in the whole creation and in all the beings, enjoying the worlds and His own creation both as the subject and object of His own creation. However there is no unanimous opinion as to whether immanent self is the same as the individual self or partner of the self. According to Advaita school, there is no distinction between the two. According to the school of dualism they are independent of each other. According to the Vishishtadvaita school, the immanent being is a partner of the dependent individual soul and resides in the heart region of the embodied being (jiva). Though He resides in the body of a being and shares the same experiences as the individual self, He is not tainted by the actions of jiva nor is subject to the qualities of nature and the laws of karma. Devotees of Vishnu are urged to meditated upon this aspect of God to experience His beauty, grandeur and bliss. By knowing Him and experiencing Him one would attain the highest and transcendental self. The consecrated image is the fifth manifestation of God. While His other aspects are His creations, the arcavatara is a creation of man. Devotees may create an arcavatara (image) using the descriptions of God's splendorous form available in the scriptures, install it in a temple, or sacred place or in one's house, consecrate it with mantras according to the scriptures and worship it in a proper manner as if its a real and living form of God. When an image of God is installed and consecrated with sacred mantras, God with His boundless generosity and infinite love for His devotees enters into the image and intermingles with its material to make it His real form. While doing so He does not lose His infinity nor His universal lordship. He does not reside in the image, but becomes the image itself. Yet He remains above the laws of karma, uncreated and unaffected by the changes that may take place in the material of the image. The image may represent of any aspect of God, His transcendental form, emanation, minor emanation, incarnation or minor incarnation. The concept of arcavatara has a significant place in Vaishnava tradition and also is at the heart of the temple traditions of Hinduism for which it is so well known. Unlike the transcendental being who is formless and well beyond our minds and senses, unlike an incarnation, which is temporary and withdrawn once the purpose is fulfilled, and unlike the emanations which are far and away in the higher planes beyond our cognitive experience, an arcavatara is a permanent manifestation of God which is present here and now and within the grasp of our senses. It a living image, an embodiment of divine consciousness, with which we can interact directly with our hearts and minds. The consecrated image of God is not an illusion. It is neither a figment of our imagination nor some kind of self deception, but a permanent aspect of God which continues to remain so amidst us in the image form so long as we worship Him with devotion and offer Him our daily prayers. In the Vaishnava tradition arcavataras are categorized as Samvyakta, divya, arsha and manusa. All are auspicious and worthy of veneration and worship but some have greater potency. The Svayam-vyakta type arcavataras are believed to be self created. That is no human or natural force crafted them. They are considered to be supreme among the arcavataras as they came to us by God's will for the benefit of the mankind. Hence their potency and influence are not confined to the place where they are installed. They benefit not only those who worship them directly but also others who worship them from a far away place. The images found in the temples such as Srirangam, Tirupathi, Kanchi, Bhadrachalam and the saligramas that are worshipped by people in their houses are considered to be Svayam-vyakta arcavataras. The Divya or divine arcavataras are those that have been installed and consecrated in the past by divinities such as Brahma and Indra. The Arsha type arcavataras are those that have been installed and consecrated by sages and seers such as Bhrigu and Markandeya. Finally the manusa type arcavataras are those that have been installed and consecrated by ordinary men and women either in the temples or on their own homes. For the purpose of worship they are equally useful and effective as the other arcavataras. However they need to be installed and consecrated according to the scriptures before they can be considered as arcavataras. Of all the aspects of God, the arcavatara is considered to be of greater value to the mankind as they are an inseparable part of our reality and existence. Unlike His other aspects, the arcavataras are regarded as both Sesi and Sesa or master and property because apart from being worshipped as God, they are also owned as pieces of property. Followers of Vishnu believe that worshipping an image of God and meditating upon Him would dispel all the sins of the worshipper and grant him Moksha because the arca is but God Himself in His full-fledged form with all His attendant and supreme qualities and powers. Description of the aspects of God would be incomplete without the mention of the manifestations of Prakriti or Mother Goddess, which the followers of Vishnu call as Maha Laskshmi or Sri Devi, popularly known in Hinduism as the goddess of wealth and abundance. She is an inseparable part of God in all his forms and aspects and manifests herself wherever and whenever He manifests Himself either as an incarnation or an image. Even when she is not shown separately, she is part of His manifestation and constitute His heart. As a mediator between the jivas and God, she rules the hearts of men through the power of her boundless love. She draws the self-absorbed, detached, dispassionate transcendental God into the act of creation and makes Him law giver and protector of the worlds. She incarnates whenever He incarnates upon earth. She manifests wherever He manifests. She is the source of His qualities and powers and of all His emanations and incarnations. She too becomes an image, when he chooses to enter into an image as an arcavatara and mingle with its material, which is but Prakriti in its earthly aspect. The act of creation would be incomplete without Her and so is our devotion. 1. Readers are requested to consider this as a generalized over view of the five aspects of God according to the Vaishnava tradition, as there are many variations and schools of thought within Vaishnavism which we have not included in the scope of this presentation. 2. According to another version, the vyuhas are only three in number. Vasudeva is considered as the transcendental being itself as he has all the six qualities of the latter, where as the other three have only two qualities each. 4. He grew out of the body of Vamana.